situated on a quiet and mature tree lined street, this lovingly maintained 4 bedroom side split exudes pride of ownership throughout. this cozy, carpet free home offers main floor open concept living/dining, kitchen with updated and stunning back splash. main floor lower level is complete with access to garage, bedroom, powder room and back yard access. upstairs, 3 generous sized bedrooms and full bath. lower level offers substantial recreation room, gas fireplace for those cold winter nights, convenient laundry and additional storage. 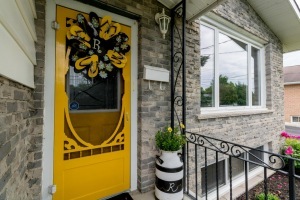 enjoy your summer days with all that this superb location has to offer, by relaxing in your private over sized oasis of a back yard with in ground pool or walk to the waterfront, schools, parks, trails and downtown. this home has seen many updates over the past 5-10 years including but, not limited to all flooring, windows, shingles, brand new pool liner and security cover.